Thank you to everyone who came out on this BEAUTIFUL day and ran with us. As the pictures roll in, we’ll be sure to add a link to the gallery so that you can like and SHARE!!!! 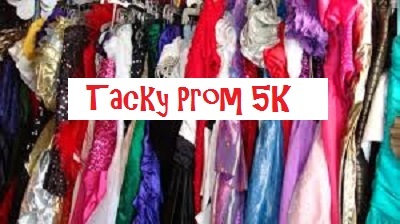 Check out the results by clicking TackyPromFinalResults!!! Congratulations to our winners, who estimated their finish time within 10 seconds!! Great job Lisa Dericco, Joseph Ewing, Erin Spurry and Jessica Bass!!! Laura will get up with you with your prizes!